Finnish Vorna call themselves a pagan orchestra, but it is actually to our listening benefit that the Finns do not become overly puffed up and pretentious, and do not lose their native spirit behind orchestral productions. To be fair, and more so towards the end of their second album Ei Valo Minua Seuraa, they start soaring to symphonic heights and use some clean vocals on the closer Hiljaiset rauniot, but before then the “epicness” and orchestration remain fairly grounded. Sure, Itseton has a grand opening, weaves in more keyboards as it unfolds and dissolves into ethereal marching. And in Yksin cello, a non-traditional instrument in metal, has a nice overture before the track becomes orchestral. Yet, Vorna do an excellent job restraining themselves and unfold their storytelling compositions, with passion, but not pretense, seething throughout. One would think that Ei Valo Minua Seuraa draws its inspiration from Finnish nature, evidenced by birds chirping and creeks flowing in Vaipunut. Also, perhaps, it may be easy to describe Vorna as a cleaner, lighter and a little more keyboard oriented version of Moonsorrow circa Voimasta ja Kunniasta. The unhurried melodies, even if buttressed by double bass, or tremolo executed, hoarse growling, Ei Valo Minua Seuraa at first sounds like a familiar friend, but the one that makes you comfortable and welcome right away. Before you dismiss this familiarity as a lack of originality, however, expansive and caressing melodies of Jalkemme and Itseton completely vortex you in, and you just can't help liking it, nodding your head in approval, mouthing along unknown tongue words. Yes, there are tracks, like Sieluni varjossa, where the band’s vocalist Vesa Salovaara sounds like a cartoonish evil elf, a la Mortiis, but the strength and backbone are found past midway of that track anyway. 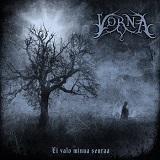 Good balance between instruments and general levelheaded feeling about Ei Valo Minua Seuraa makes it an easy album to listen to and easy to accept by the fans of the aforementioned Moonsorrow or Norther, but also second tier split-up bands like Kaliban or Cadacross.